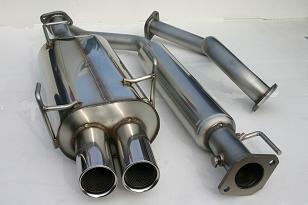 This cat back exhaust is designed for turbo or super charged cars. Although it is a direct fit to all stock mounting points. Works best when connected to our 3" turbo down pipe. Mandrel bent 3" tubing and hand crafted Stromung muffler w/Stromung embossed in the dual tips. A clean setup for a serious spec-v.